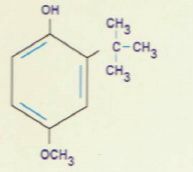 A synthetic phenolic antioxidant Butylated Hydroxyanisole (BHA) is a commonly used fat soluble food preservative since 1947, with broad biological activities. It prevents spoilage by reacting with oxygen. It slows development of off-flavours, odours and colour changes caused by oxidation. It protects animals against radiation and the acute toxicity of various xenobiotics and mutagens. Description : A white of a Pale Yellow Solid (Crystal, Flake or Pastile) with a waxy appearance and faint Aromatic odour. Identification : Dissolve about 10 mg. in 2 ml. of alcohol add 1 ml. of a 1.0 g/L solution of Testosterone Propionate in alcohol and 2 ml. of Dilute Sodium Hydroxide Solution. Heat in a water bath at 80 °C for 10 min. and allow to cool, a red colour developes.